Ask yourself – would you like to be monitored while working? For example, via taking screenshots, mouse movements or camera shots? I bet every one of you will answer – hell no. So, why many companies still use time tracking as monitoring for remote employees? It’s money, stupid, you’ll say. An employer wants to be sure that he pays for the real work. A time tracking makes sure that a remote employee/contractor is not slacking off over a paid time. To monitor them indirectly: through non-verbal signals. They are a part of the team – not isolated outsiders. A remote employee is often an isolated outsider. He is given tasks that are clearly described and have a determined output. He has to work as autonomous as possible without many interactions with the onsite team. Isolation of remote employees buts them into conditions that they must work under time tracking. They are not an integral part of the team. That is why it seems better to give them well-determined tasks. And control their execution through such straightforward mechanism as time tracking. Wouldn’t it be better if a remote employee was a full-fledged team member? In this case, there would be no need to control him. He could have been an integral part of the creative process instead of just completing tasks. In this case, a team could save time on describing tasks in details, which can be overwhelmingly time-consuming. Instead of that the team could hire a remote employee and work with him as the team member fully including him into the creative process. Some of you would say, that it’s impossible, because the remote employee is out of sight, and pretty much out of mind. You’d better give him a detailed task then wait for the result. It’s just simpler. The primary reason for that is the lack of ways to communicate with them as close as with local employees. Communication with remote employees is transactional. A manager sends a message, waits for the reply. Video calls often have to be scheduled because there is no way to see if a remote employee is available for the call. Communication with the remote employee if a set of online meetings with smaller text transactions. How much money is wasted on the miscommunication with remote contractors? A lot. You schedule an online meeting. Finally, you meet online, quickly discuss things, and he goes back to work offline. Then after some time, it appears that the guy has misunderstood many things and did his job not exactly as you expected. You schedule another meeting and go through everything again. Then again and again. Imagine if your remote employee was sitting behind the nearby desk inside your office. Wouldn’t it be convenient and easy to give him directions, discuss problems? It would be much faster, communication would be clear and easy. You could guide the direction of work more precisely, could correct mistakes sooner than later. Why all that would be possible? Because he is nearby. He is present – visible, hearable. He is ready to be approached. He instantly can hear what you say. Having such instant free-flowing communication allows you to treat a remote employee, not like just a tool, but more like a teammate. There won’t be necessary to demand him working under time tracking. You’d rather just work with him as with a team member. It would be more convenient for the employee himself. He’d feel more involved and connected rather than being used as a tool. The system that also doesn’t take into consideration time he spends on thinking the work through. Both parties win from such communication. Live video communication is the obvious alternative for in-office communication. I think we can have a live video communication only when the privacy of each user is respected. Such communication should respect privacy by design and by default. Nobody wants to be watched, that is why standard video conferencing tools like Skype or Zoom wouldn’t fit that purpose. Because these tools don’t have any protection embedded in their designs to protect from such behavior. Among all tools present on the market, unfortunately, there are no tools aimed for live video communication. That is why I created an experimental tool that provides live video communication with an individual sense of privacy. And that’s not all. The design allows to control privacy, be fully aware of your visibility for others and have time to prepare for closer contact with another user. I won’t go into details about my design. You can check it out here. Time tracking is a necessary evil for working with remote contractors, because of their isolation from the rest of the team. Such isolation makes communication difficult. It is difficult because it is transactional. Scheduling each communication transaction takes time and effort. That is why the employer wants to minimize the number of such transactions. An employer gives remote employee tasks that are well-defined. Tasks are detailed and well-defined to minimize the number of communication transactions. In the case of a contractor, since there is a detailed job description, it is easy also to attach a fixed budget with time estimation. To make sure that such a detailed task is executed on time and on the budget it is easier for the employer to take a straightforward approach – to use time tracking. There would not be a need for time tracking if there was a possibility for the employer to communicate with a remote employee in an ad hoc fashion. He would just ask informally and periodically how things are going and get feedback. Make your remote employees a favor – let them communicate their progress via live video instead of controlling them! I often see a hyped up pitch of remote work that asynchronous communication (text chat + video calling from time to time) is enough, you just have to adapt to it. Asynchronous communication is great when a teammate has complete and clearly defined tasks. He can get himself secluded to stay focused to complete the tasks. It is better for him not to interact with fellow teammates to avoid unnecessary interruptions, stay in the state of the flow and get things done. But how often does a team member have complete and clearly defined tasks? Not often. Usually, tasks are not complete. They often need clarifications, more brainstorming, advice from other teammates. Work is usually a boiling pot with discussions, questions, helping others and getting help from others. Staying in the state of flow is often mixed with interaction with others. That’s when real-time synchronous communication is needed. That’s why in the long term, asynchronous communication makes a remote worker a hermit. It separates people. Have you ever worked in a company where people sit in the same room with their headsets on, preferring to talk via text chat instead of face to face? I have. You can feel the air of isolation and separation in teams like that. You’d think a couple of times before approaching someone to talk face to face. Why? Well, because you think he is super busy, and he doesn’t want to be interrupted. At least he looks busy. And it is the norm that everyone prefers text chat and async communication in general. Separation only grows over time. Having real-time face to face as a default mode of communication, allows teammates to interact in a more creative and diverse way. People know each other better. They can socialize and have fun. Over time the team forms some kind of a collective mind. The ability to communicate face to face by default means that the relationships within the team are staying healthy. That is why many companies prefer open office plans because it forces teammates to have a real-time face to face communication as a default. It also prevents team members from isolating themselves and resorting to async communication as a primary mode. The bad news is that remote work forces to communicate asynchronously. The usual configuration is text chat + video (or even only audio) calling. Remote teammates are isolated. In such a situation it is difficult to create the same real-time face to face communication environment that you have in an open office. You can make a Skype call and leave it always-on. Somebody does that, actually. It can work but it feels unnatural. First, working remotely usually means working from home, often “in pants.” Nobody wants to be seen the same way as you are seen in the office wearing office clothes. Second, software like Skype allows others to look you straight in the face in full screen. They can see every little tiny wrinkle on your face without you knowing that. Isn’t it big brother-ish? It feels awkward and weird. Third, anyone can turn the camera off unless a team manager forces everyone to remain live-streaming. Considering the awkwardness, it can be tiresome for the team members. So, what kind of solution could be for the mentioned problems? You can see that the guy is there but it is not clear what he’s doing and how he’s dressed up. Second, a remote teammate should be aware of how others can see him, to avoid cases when others can see something, that he doesn’t expect them to see. Third, there should be no unexpected things happening. Like when it takes only a second to unblur a teammate. It’s not cool to be suddenly unblurred when you’re picking your nose. Every change of privacy should be notified upon and should be gradual. So, the teammate could prepare himself (get a finger out of his nose). Is there any tool that does the mentioned things? Well, now there is one – VideoWorkLink (VWL). It’s an experimental tool that has all the features described above. VWL allows remote teammates to remain connected via live video without feeling discomfort. The one that they’d feel in an always-on Skype video call. In this article, I want to make a point that remote work needs real time face to face communication by default in order to continue winning the minds of team managers. Having only async communication is not enough for successful collaboration over the long term. To solve the problems mentioned in this article I’ve created the product – VideoWorkLink (VWL). I encourage you to try it out (it is in free beta) and let me know what you think! You can download it by clicking the button below. Author Oleg GalkinPosted on February 28, 2019 March 26, 2019 Categories Uncategorized, VideoWorkLinkTags All posts, always-on video conferencing, VideoWorkLinkLeave a comment on Stop being a remote recluse. Why remote work needs real-time communication by default. VideoWorkLink (VWL) boosts the speed of your communication with remote teammates. Below you can find info-graphic illustrating how VWL can speed up communication up to 20 times for the team of 5. The left column (Old Way) illustrates how most remote teams communicate today – asynchronously, using the request-response method of communication. The right column illustrates the new way of communication – synchronous (real-time) communication via VWL. As you can see below, the old asynchronous way of communication is awkward and has lots of barriers. Such awkwardness increases dramatically with a number of people in the team. The new real-time (synchronous) way of communication via VWL eliminates barriers and boost the speed of communication 4x times, where X is a number of remote teammates. That means that a team of 5 can communicate 20 times faster if it uses VWL. The update includes several bugfixes and minor issues. Just press Install button and everything will be working as good as before. This window appears because we have re-signed application’s executable files. If you have any issues, questions or ideas please do write us! What problem does VideoWorkLink solve? Slack Technologies’ office in San Francisco. 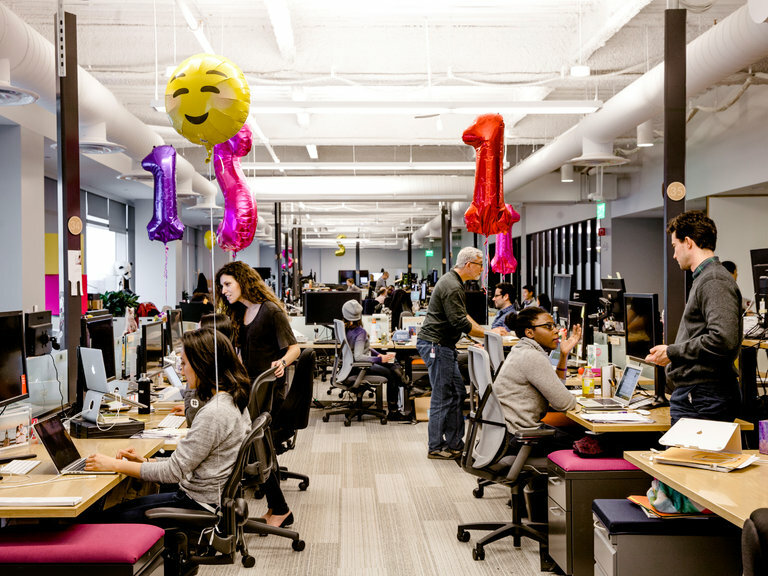 Many startups, including Slack, love open office plan like the one shown on the photo above. Do you know why? Because of the possibility for spontaneous communication. Lack of spontaneous communication in teams scattered over different locations (rooms, offices, cities, countries) is the problem that you need to solve in order for your team to be a single cohesive unit. A scattered team is like a network of isolated autonomous individuals rather than a connected whole. It is like being in the office where teammates are in separate rooms with doors locked from the inside. If you want to make a close contact you have to “knock” – make a video-conference call. The other party, of course, must answer it. It makes spontaneous communication impossible. Text chat helps, but typing is much slower than talking. Moreover, it is asynchronous – you might not get an immediate answer after you’ve sent a message. Another delay. Chat gets overloaded with messages quite fast and it is hard to keep track. You could make a video-conference call and leave it always on forever, you would say. Yes, but video calls are not meant to be left forever. The odds are that you will have high Internet bandwidth consumption, high CPU load. Moreover, anyone will be able to watch you (in High Definition) without you knowing about that. It is like if someone could stare right at your face at a breadth distance without you knowing that. Would you like to be watched that way? I don’t think so. That is why nobody does that always on video-conferencing thing. Without spontaneous communication, your process of working together slows down dramatically. Because the opportunities for spontaneous communication don’t exist, a scattered team have to rely on ad-hoc online meetings or on more formal, scheduled online meetings to get their work done. However, because organizing meetings takes effort, a lower overall frequency of meetings results. This lower frequency of meetings, in turn, results in less work being done by the collaborators on their joint problems, particularly the problem of refining and coordinating their work plan. Thus the collaborators are not as timely in giving each other feedback on the directions their joint work should go, and hence they take longer to construct and select among the alternatives that guided the course of their work. This problem never becomes clear to the participants in the remote collaboration because each meeting seemed productive and useful, and they did not have other, spontaneous contacts that they can use to supplement these meetings. There are several products on the market for a continuous audio communication, like TeamSpeak, Mumble, Ventrilo, Discord. But having only audio is not enough because it is impossible to know beforehand if a person is present and available. Also, there are products like Sneek and Nowbridge. Despite possible privacy problems, such products provide a sense of presence and provide a possibility for an instant contact. But they still do not provide the possibility for spontaneous communication, because you still have to make a contact in order to communicate with a teammate via audio. To this date, VideoWorkLink is the only fully-fledged software on the market created to solve the problem of a lack of spontaneous communication in distributed teams. It links you up with remote teammates by the means of video for the whole working day. Yet, it does that with respect to your privacy. By default, you are blurred for your teammates. You know when someone unblurs you. You see when someone enters into a close contact with you, and it is done in a smooth slow way, in order for you to prepare for a contact. Spontaneous communication is a key component required for communication in a creative team. For a successful creative process, a team has to have a possibility to instantly exchange ideas and coordinate work. Among all products present on the market, VideoWorkLink is the only product that has all means necessary for providing a possibility for spontaneous communication to a distributed team. You can see who is present and available, enter into a close contact with a teammate, talk to all team. With VideoWorkLink your team will be together no matter the distance between each and every one of you. Author Oleg GalkinPosted on September 19, 2017 October 23, 2017 Categories VideoWorkLinkTags All posts, always-on video conferencing, isolation, spontaneous communication, VideoWorkLinkLeave a comment on What problem does VideoWorkLink solve? After many months of hard work, the product is finally available for download. Dear friends, I encourage you to try it out! Since it is a test release, the product will collect a usage statistics and record audio & video feeds. Since your audio feed will be recorded, you can say what you think about the product right into the microphone. You will be heard, and your words will be taken into consideration. Your thoughts and ideas are very welcomed! Please, feel free to check out the product that is absolutely unique on the market! As you can see, the previous post dated 2012, and there was nothing published after that for 5 years. What happened, you might ask? The project wasn’t dead all these years, quite contrary, under the surface, it was very much alive. I have done a lot of work in the last 5 years. What was done in the last 5 years? Why it took so much time? Well, I have to make my living working on a regular job; I am working on this project on my spare time. Yes, it is a fully bootstrapped project. The product will go live within next few weeks. Every 1 – 2 weeks I will publish an article on the product, its design and idea behind it. It is going to be interesting. A lot of original content with new ideas coming soon. Thank you for reading and stay tuned for updates!